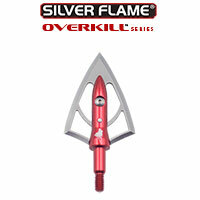 We are very pleased to introduce the new GrizzlyStik REDLINE series of our well known Silver Flame broadheads. These are exactly the same as our Original Silver Flame broadheads, they just have a different stainless steel in the blades. They’re GrizzlyStik quality and performance through and through! Here at GrizzlyStik it has always been our mission to make the best performing, most lethal arrows and broadheads that we possibly can. We’re constantly tweaking, changing, upgrading, and designing. We’re always looking for ways to improve the products we have and we’re always looking to the future so we can create new products to assist bowhunters with their bowhunting success. 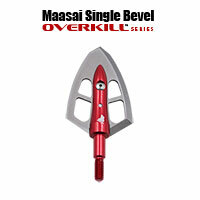 Our Original Silver Flame broadheads have earned their place as the gold standard of double bevel broadheads. 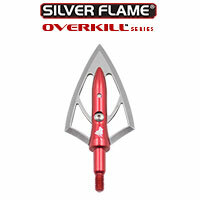 Silver Flame broadheads have taken everything from whitetails to elephant – they have proven themselves for decades on big game all over the world. 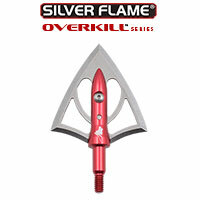 Silver Flame broadheads have always been a premium broadhead - manufactured with the best materials available and as such, they have always carried a premium price. We required a quality steel that would take an edge and would be effective on all big game. The one thing we refused to compromise in was inherent ability of these broadheads to effectively put down big game fast. In time our engineers decided that AUS4 stainless steel was the best choice. It’s not just the steel either, it’s our proprietary heat treating process that optimizes the full potential of the AUS-4 stainless steel we’ve selected. We’re able to keep the Rockwell at 54 - 55 to optimize the durability and edge retention of the steel and this steel, after our heat treat, is also quite willing to take a good sharp edge. All GrizzlyStik REDLINE broadheads are sharp - hunting sharp right out of the package. If you’ve wanted to try GrizzlyStik broadheads, but have never taken the plunge – order a pack of our Silver Flame REDLINE broadheads today! Shoot them this season and remember to send us pictures of your bowhunting success!